Being exalted with the Council rewards (and of course unlocks Council of Exarchs Tabard). Also makes Dusty Rockhide available. Vindicator Nuurem is their quartermaster, located in Stormshield Town Hall in southern Ashran, the massive PvP island in the east. Socrethar's Rise & Darktide Roost (both south Shadowmoon Valley) are full of level 100 mobs that give Council of Exarchs rep.
Mobs stop granting rep at 0/999 Exalted, I don't have any incomplete quests or bonus objectives to see if they would contribute to maxing them out. I have a feeling it is intentional, perhaps as a pre-requisite for the Council of Exarchs related Garrison Campaign quests to appear? If you're solo grinding for this rep, I found a good spot is right near the flight point at Socrethar's Rise along the path up to where Invokaz is located. It's far enough away from the clickables for the Apexis daily that there usually wasn't much competition despite its nearness to the flight point. I would kill my way up the ramp and kill everything up top, then jump back down and everything at the bottom had respawned. Also, don't forget to bring along any Barracks Bodyguards you're working on getting Wingman with for any of the Draenor rep grinds! Double the rep for your efforts. Currently available to complete as horde (though actually gaining the rep is impossible). Will probably be fixed eventually. So...if i were to faction change a horde character who completed all of frostfire ridge and has...say revered with the frostwolves, upon faction changing would i have revered with the council? If so would i then be able to do all of the shadowmoon valley quests to possibly gain exalted with the council? Or would it be like the hozen/jinyu from mists where your rep would be instantly reset (At least when going from jinyu exalted to horde and then killing a hozen in the jade forest) near the start of the questing? Or just completely reset to neutral/friendly? I'm not one for massive rep grinds, but i've been feeling like faction changing for a while and this might be the time to do so if i can get exalted with this faction without any mob grinding. 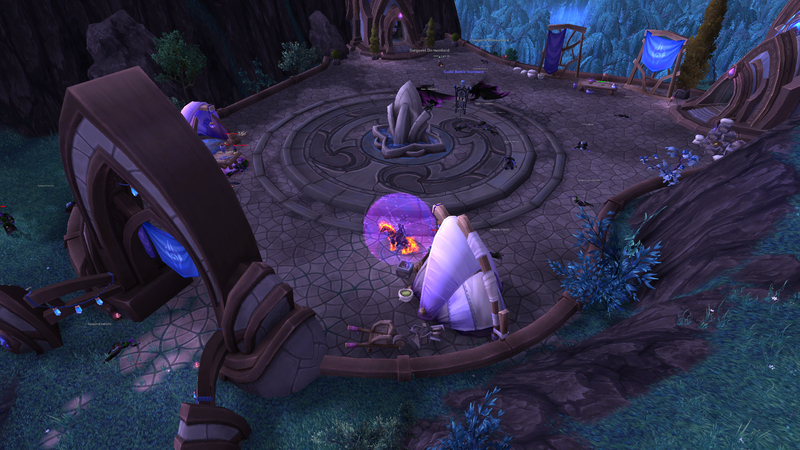 If you're working on this rep, don't miss out on the Bonus Objectives in Talador. Both Orunai Coast and Court of Souls gave me 500 Council reputation. The others in the zone might work too, but I did them while leveling and didn't pay attention to reputation gains. I faction changed my horde to alliance, who was around 9k/21k with Frostwolves. Frostwolf rep switched accordingly and I was able to do most of the Shadowmoon quests and quests in other zones that give Exarch rep... by the time I finished I was around 19/21k with Council of Exarchs (numbers may be a little off, apologies), easily grinding the rest of it out in Socrethar's rise. It is indeed an easy way to get exalted with this faction if you don't feel like grinding rep the long way. Edit: Forgot to mention I faction changed to human, so rep may vary! My attempt at maxing this rep today (had exactly six bars of rep left when displayed as an experience bar) went pretty decently. I'm a 640ish feral druid, brought a skilled 660ish DK tank with me but I'm sure any competent tank with good self-healing awareness will do fine, although I was helping with my own heals. Knocked out three bars' worth in about an hour and a half before boredom kicked in. Go to Socrethar's Rise, preferably on a day where it's not a daily for either faction. Some people will always be around - on garrison objectives, or farming on their own - but that's fine, and people left us alone once they realized we were dominating the area in question. North of the body of water is a circular terrace with a stone fountain in the middle and two small buildings around the edge. 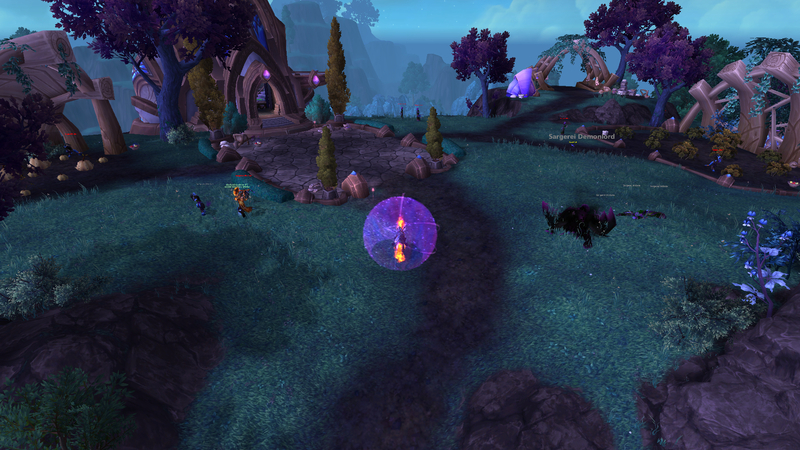 The worst mob in the area is the Sargerei Demonlord who spawns between two Sargerei Demonspeaker. (Put your Battle Standard down right after you pull!) They will occasionally cast Demonic Empowerment on him, so take them down quickly. Mind spike also hurts so remember your interrupts and be wary of pulling extra mobs. After that, work your way around this area, into each of the buildings and just outside the archway-entrance. Don't outrange your banner, there's no need. The respawn rates come quickly enough, with the tough guy up in about 3 minutes. An ideal spot to farm this rep turned out to be at Pillars of Fate. While I was farming I had Unstable Void Portal pop up for me multiple times at two different spots: one spawns at 73.48,30.88 and one at 74.19,32.42. Void Fragment pour out of them and each of these gives 5 rep each. It will stay up for about 2-3 minutes. Going in is an option, but in my experience gives less rep than staying out and killing what comes out of it. I have been unable to figure out their spawnrate and what made them spawn. I parked a Battle Standard of Coordination in between the 2 spots and in half an hour I've had both portals spawn twice, alternately. Meanwhile killing the mobs around the houses there made the rep farm a bit more bearable. As pointed out by others, the wisest thing to do is to not farm at the spot if it's the daily. When you hit Revered Exarch Akama sends you a message titled The Exarchs have Faith in You. You have proven yourself to be a great friend to the council of Exarchs. An indispensable ally in our time of greatest need. Thank you for your continued efforts to defend Auchindoun and reclaim Shattrath. The Prophet once told me that we only see shadows before us when the light is at our back. With Faith, we will prevail! I have spoken with Vindicator Nuurem, the Exarch Quartermaster located at the Stormshield town hall in Ashran. Some supplies are available to you there. The reputation bug was fixed in patch 6.1. You get to 999/1000 exalted through grinding now. Go to Socrethar's Rise in Shadowmoon Valley with a group of 4-5 people. Have 2-3 people at and 2 people at . Have both groups of people continue to kill mobs in these two areas at the same time since they are close together and rep will be shared among all group members. The reason for having more people at is because the mobs spawn a bit faster there. Avoid pulling Sargerei Darkblade from along the edges since they are not worth the time it takes to kill them. Overall you will get about 5k rep per hour (without reputation bonuses) doing it this way so it will only take a few hours to reach Exalted. Thanks to the 6.1 patch you can now get 999/1000 rep instead of 0/1000 rep! For quicker rep gains make sure to place a Battle Standard of Coordination wherever you are farming. Also don't forget that getting exalted will give you the title Prelate and the ability to purchase Dusty Rockhide for 4,000g (Exalted discount) and 5,000 Apexis Crystals. from Sergeant Crowler in your garrison. Fly down to socrethar's rise and finish that apexis mission by killing as many people as you can at once (primarily in the lower area here) then go back to the flight master and fly to darktide roost and have some fun there! After completing both missions hearth back to your garrison, get the missives again, and then you have a cool 1600 apexis crystals every time! Rinse and repeat until exalted. Happy hunting! I just hitted Exalted with this rep, and I found that farming at the Pillars of Fate was the best choice for me. I found a group in premades that was farming there, all we did was teleporting in the void realm through the portals located at the highest zone of the Pillars, and killing all the 100 elites there. They granted 19/20 rep each, have a very fast respawn timer and in group they were easy to kill. Tried to farm in Sochretar's Rise, but I think that it takes too much more time farming there compared to the Pillars, although I guess that it's easier to solo mobs there. As with Socrethar's Rise and Darktide Roost, you can buy a missive for this quest from your garrison quartermaster, giving you 3 total buyable missives for apexis crystals that double as a reputation mob grind for Council of Exarchs. Don't forget: this is the area that you fly to Akeeta's Hovel to get to, which looks like it's in Spires of Arak but is actually western Shadowmoon Valley. One farming spot I've not seen mentioned is at Pillars of Fate, inside the portal (72.29, 23.57). Tiny mobs that come in packs of 5 give no rep, normal-sized mobs give 5, elites give 16. Kill 10 non-elites for the Power Overwhelming buff which turns you into a voidlord, pull as many elites as you can with your first two skills and when they're all on you use the third skill and watch them melt. Lather, rinse, repeat. I only discovered this on my last 2 bars of rep, unfortunately, but it went much faster than farming anywhere else. After hitting level 111, it seems I've gone from getting 5-6 rep per killed mob down to 1. Not sure why, but if you wanna grind this rep, might be best to dust off one of your 110 or lower toons. I am now getting 5, 8, 16, and 50 experience per kill in Socrethar's Rise! Gaining reputation with Council of Exarchs is relatively simple--just quest through most zones and head back to complete bonus quests along the way. There are no daily quests. There are three areas in Shadowmoon Valley with level 100 mobs that grant reputation when killed--Socrethar's Rise, Pillars of Fate, Darktide Roost.